Here’s a primer to editing your WordPress site. More detailed information can be found on the WordPress help pages but this should get most clients started quickly. 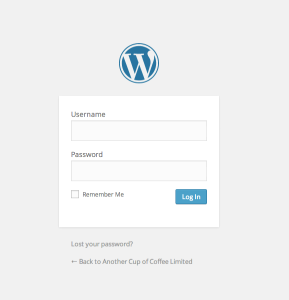 To login to your WordPress site, go to http://yourdomain.com/wp-admin. (Replace yourdomain.com with the domain for your site.) You will be presented with the login screen. Enter the login details you were sent after your site was launched. If you’re logging in for the first time, please remember to change your password under the Users > Your Profile menu item. After logging in, you should see the WordPress Dashboard. If you don’t see the screen below, hover over your site name on the dark menu bar at the top of the screen. You will see an option to switch between Dashboard view and Site view. Site name menu allows you to switch between Dashboard view and Site view. Hovering over your username will allow you to log off. Click the Posts menu item to view, edit and create new posts. Click the Pages menu item to view, edit and create new pages. This WordPress article gives a good overview of the differences between pages and posts. You can add new content or edit existing ones. Click on the Posts or Pages menu item on the left and either select existing content you want to edit or click Add New. The editing controls will be quite familiar if you’ve used a word processor like Microsoft Word or Apple Pages. The Visual and Text tabs allows you to switch between visual editing with toolbars and HTML coding. If you don’t know how to code web pages, make sure you’ve selected the Visual tab to bring up the editing toolbar. The editing toolbar works just like a word processor. Highlight your text and select the format option on the toolbar. Type your text in the text editing are. For security, it’s best to log out after completing your edits. If you decide not to log out, you’ll see the WordPress menu bar at the top of your site whenever you visit. This will only be visible to you and other content editors who are logged in. Normal visitors will not see the WordPress menu bar. WordPress is quite simple to use so this short guide should cover the majority of day-to-day content management tasks for most of our clients under a maintenance package. For help on anything specific to your site, please contact me.